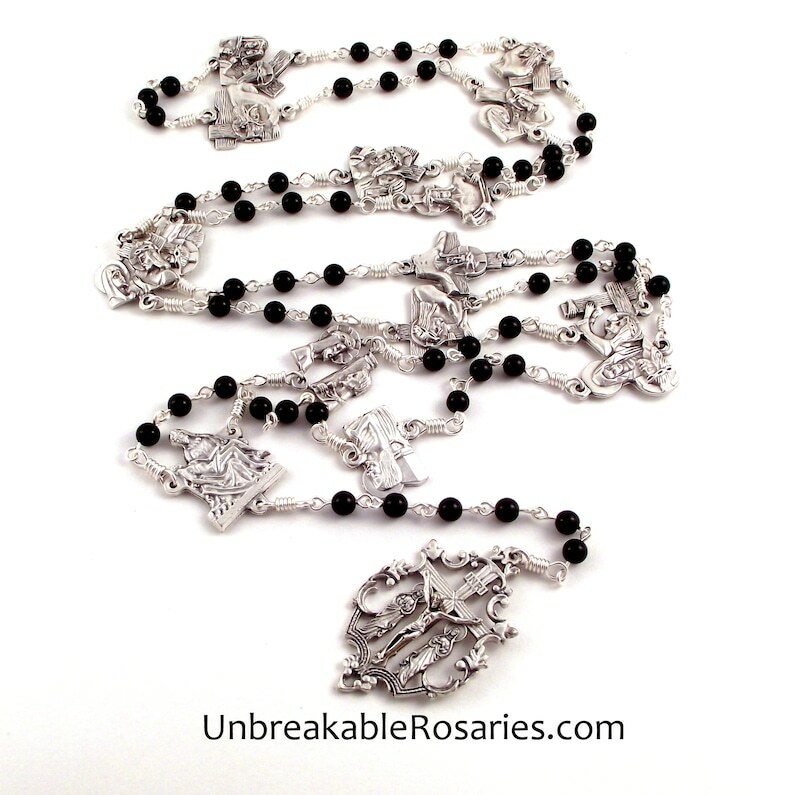 This is a traditional Stations of the Cross (or Way of the Cross) Catholic rosary. It will last a lifetime. All of my rosaries - should the construction break during normal prayer - may be returned at any time for free repairs. Prayer instructions are included. Beads: 6mm Shiny black onyx. Crucifix: A beautifully detailed cut-out crucifix with the Blessed Virgin and Mary Magdalene at the foot of the cross. Measures 2-1/4" high by 1-1/4" wide. Center: 1" High La Pieta medal. Medals: Each measures approximately 3/4" high with the image on the front and the corresponding station number on the back. Made in Italy. The medals are arranged so as to pray clockwise (starting left of the center). If you pray counter-clockwise let me know and I'll be happy to reverse them for you. Length: Approx. 34-1/2" (This measurement represents the length from the bottom of the crucifix to the mid point of the beads on the loop, when stretched taught.) Please note that this is too long to wear as a necklace. Construction: Chain link with silver-plate wire. Each of the Station medal links, as well as those on the center and crucifix are wrapped with bow-tie links.